With an extended shower hose and shower head placed within reach of the handicap user, one can take back control of their shower experience. Handicap shower heads are highly beneficial to people with disabilities and those who care for them. They are highly adjustable and made to be within the reach of those sitting down on a bench or using a wheelchair. The ease in which a shower can be given with a handicap shower head allows for a much faster, cleaner and comfortable shower experience, for everyone involved. With an ADA shower head, you are able to sit down and bathe. No more extended standing or reaching for the shower heads. The ADA shower head heights can be adjusted up and down according to your own preferences. Adjustable Handicap Shower Heads – This wall mount hand shower head is the one shown in the images above and below. It offers adjustable heights, a long shower hose, massaging sprays and a 30 inch wall fixed bar. Full Spray Hand Shower – Comes with a push button that slows the water down to a trickle during shower spray usage. Very affordable. Long Shower Hoses – These shower hoses are over 6 feet in length and can be extended and stretched to over 8 feet. That is plenty of hose to create a shower head for the elderly that covers any showering area. 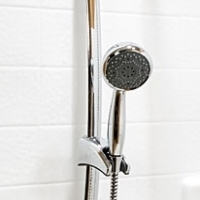 ADA requirements require handicap shower head units to have a hose length of at least 60 inches. 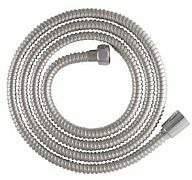 Longer hose lengths are recommended for larger shower environments and for people sitting on handicap shower bench. For fixed shower heads, they should be mounted at 48 inches above the floor level. Transform a bathtub spout into your own personal handheld shower spray. The shower head is suctioned on the wall while the hose end is attached to the spout. The process of installation is quick and easy making this portable handheld shower head a great addition for any trip or vacation. The disability shower hose has a length of 5 feet for maximum maneuverability. You can use this shower head when you are sitting down. The primary kind of handicap shower head available is the handheld shower head. This kind of handicap shower head allows the user to hold the shower head in their hand, directing the flow where needed. They will come with a adjustable height shower head holder that can be positioned to the user’s needs. Shower stands can also be used to hold these handheld shower heads when not in use. Typically attached to the tap in the handicap shower tub, a separate screw-in holder can be attached at a level that is accessible to the user. The user can adjust the shower spray to their preferred heights. Some even come with an on-off water-saving button or switch directly built into the shower head so there is no need to stretch for the water handle. There are massaging shower heads that adjust the pressure, spray and flow of the water to provide a mist of water or a nice rainfall. Many versions of these handicap shower heads are inexpensive, although price will often relate to the level of quality. Chrome, plastic, brushed nickel is just a few of the choices of styles. Handicap shower heads are not covered by Medicare as they are considered personal convenience items. Prices for shower heads costs $30 to $70 for the standard lower end models and can range from $150 to $300 for the higher end models. The largest benefit of the handheld handicap shower heads is the ability to either give or take a shower quickly and easily. It can provide a sense of freedom for the disabled person or wheelchair bound person, who has relied on others for their showers, to allow them to shower by themselves. This sense of freedom and empowerment can transfer over into all parts of their lives. Taking control over their own life and situation can help the disabled person immensely, and a handicap shower head can be one step in that direction.